Linear infrastructure, such as roads, railways, powerlines, pipelines, tracks and trails and the vehicles that travel on them are critical to supporting economic growth and development. However, the ecological impacts of linear infrastructure and vehicles can be massive, and usually negative. These impacts include habitat loss, fragmentation of habitats and populations, mortality of wildlife due to collision with vehicles, weed and pest animal invasion, changes to microclimates, elevated rates of poaching and wildfires, to name but a few. 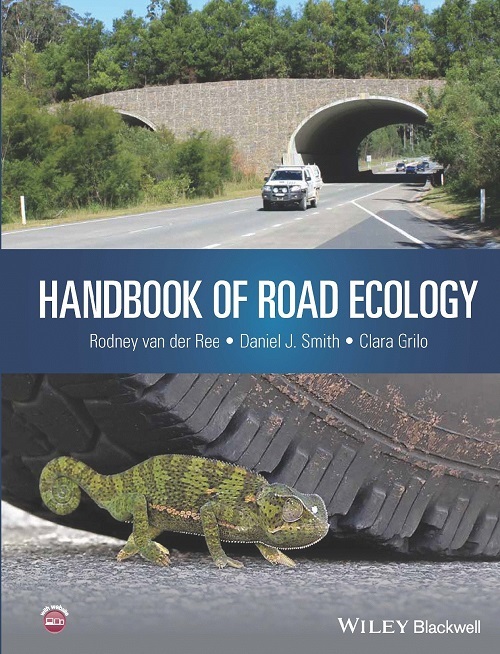 Fortunately, the Handbook of Road Ecology, published by Wiley in July 2015, provides solutions to each of these issues, plus more, ensuring that if adopted, the future transportation networks can achieve economic growth while avoiding or minimising the negative ecological and environmental outcomes. I working on slender Loris conservation in Tamil Nadu India. I strongly believe that road network here is affecting population of Loris here. How can I get this book for my further reference. Hi Sasi, you can purchase the book directly from Wiley or other booksellers (such as Amazon etc), or you can apply for a free copy. just go to the this page https://handbookofroadecology.org/free-copies-developing-countries/apply-now/ and fill in your details. There will be a Safe Wildlife Crossings Collaborative meeting here on May 18th. You would be welcome to make an announcement about the book or I will intend to mention it and eagerly await price and release date. Hi Sandy – that would be wonderful if you could mention the book at your meeting. Unfortunately I am in Australia and wont be able to attend! The purchase price in USD for USA customers is $150 for the hardback and $120 for the Ebook, with a June release. It also looks as though some of the big online retailers may be offering discounts as well. I have been surveying road kills and have a long list of reptiles, birds and mammals that I have encountered. I wish to get this book. Request you to kindly let me know how do I get it. As India is classified by the World Bank as a lower-middle income economy, you can apply for a free copy via this website. Alternatively, if you have the funds to buy your own copy, you can order it online from any good online book re-seller. I am pleased to request for a copy of the book. Hi Moses, as Uganda is classified by the World Bank as a low-income economy, you can apply for a free copy via this website. Alternatively, if you have the funds to buy your own copy, you can order it online from any good online book re-seller. Hope that helps, and thanks for your interest! I feel happy that many unanswered things of road ecologists may turn out to be some conservative strategies. As I am working on roadkills of reptiles. I am eagerly waiting for the book. Hope it will be available soon. It is a very useful addition in a very important subject area especially for professionals in the developing world as we have to deal with the issue of mitigating the negative impacts of linear infrastructure esp. Roads being aligned through our wilderness areas almost on a daily basis. Well done.